Art and nature have been a constant influence in my life from a very young age. I studied Natural Science Illustration and Children’s Book Illustration at Rhode Island School of Design, and have a BS in Animal Science from the University of Vermont. At the age of 13, I made my first pet portrait, a colored pencil drawing of our two Labradors, as a gift to my sister. Since then I have created many others for friends and family, and have been doing so professionally since 2009. I choose to paint animal portraits because it allows me to explore the color and texture of my favorite subjects, and produce one-of-a-kind memories that my clients will enjoy forever. 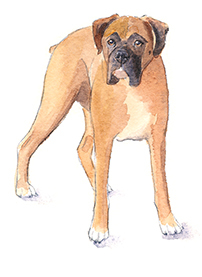 My own dog, Byron, was the patient subject of many illustrations and portraits in his 14 years. In person or in front of the camera he never failed to show his immediate true feelings. He accompanied my husband and me on all our outdoor adventures, but also appreciated the comfort of staying at home by a warm fire. His sharp doggy mind, mischievousness, and adoration gave us immeasurable amounts of happiness and amusement. Our pack also includes Leila, an 8-year-old rascally Mountain Dog mutt with beautiful markings, big white paws, and excellent Frisbee skills. We live in Albany, NY.